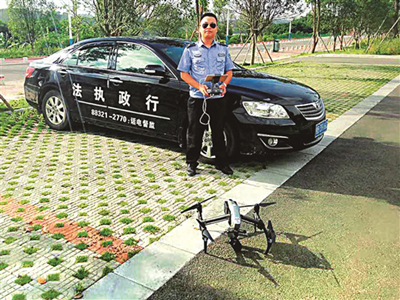 Liuzhou’s cops sure like their new toys. Three years ago, they took to patrolling the streets on those ridiculous self-balancing scooters which were all the rage at the time. It didn’t last long. Like petulant children, they threw them aside and searched for the next toy. Now we are informed that the local constabulary has been provided with the latest fad – drones and selected officers are being trained in their use in crime prevention and detection. OK. I added the last sentence.
. This entry was posted on Thursday, July 27th, 2017 at 4:03 pm	and is filed under Liuzhou News. You can follow any responses to this entry through the RSS 2.0 feed. Both comments and pings are currently closed.